Chokecherries are small dark red-to-purple berries that grow wild in the some parts of the United States and are native to the Northern Plains. Although the fruits are tart when eaten alone, when sugar is added they make excellent jams, jellies, syrups and pies. This recipe yields approximately eight to 10 ½-pint jars of chokecherry jam. Remove the stems from the chokecherries and rinse them thoroughly in cool water. Place them into a large saucepan and add three cups fresh water. Bring the mixture to a rolling boil over medium-high heat, and then reduce heat to low. Simmer for 15 to 20 minutes, or until the skin on the cherries pops open. Place a jelly bag over the top of a large mixing bowl. Pour the cherry and water mixture into the bag and allow the juice to drain into the bowl. Leave the chokecherries to drain for 20 to 30 minutes, but do not mash or force the liquid out. Measure out three cups of the liquid from the bowl and pour it into a large saucepan. Add the preserving sugar, and mix thoroughly. Taste the mixture and make sure it's sweetened to your liking. If not, add a bit more sugar and mix. Bring the mixture to a boil over medium-high heat, and then add the liquid pectin. Mix well and continue boiling for one full minute. 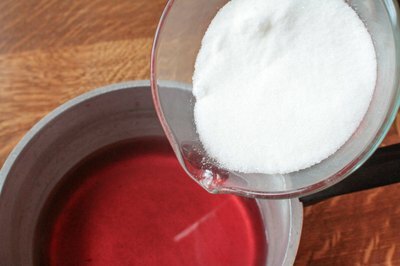 Remove the pan from the heat, skim any foam from the top of the liquid, and then pour into sterile jelly jars. 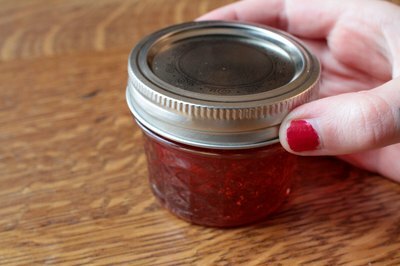 Secure the lids on the chokecherry jam, label with the contents and store in the refrigerator. The jam will set over the next few hours. Serve on toast or muffins, or anywhere you desire a sweet jam. The jam will store for up to three months in the refrigerator.